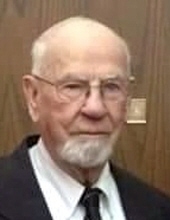 Peoria- Hubert J. Kleemann, age 93, of Peoria, passed away on Friday, April 12, 2019 at OSF St. Francis Medical Center. Hubert was born on August 17, 1925 in Clinton, IL, a son of Pius and Rosa (Harpeneau) Kleemann. He married Phyllis J. McBride Bray on April 23, 1988 in Peoria. She survives. Hubert is also survived by five sons, Mark (Karen) Kleemann of Peoria, Paul (Robin) Kleemann of Highland, IL, Brian Kleemann of Aurora, IL, Daniel (Florence) Kleemann and Kevin Kleeman, both of Peoria, three daughters, Renee Watters of Tallahassee, FL, Diane Hayes of Alexandria, VA and Annette Kleemann of Downers Grove, IL, and one step-daughter, Michelle (Phil Huckelberry) Bray of Brookfield, IL. He is also survived by 8 grandchildren and 5 great-grandchildren, as well as, one sister, Rosalie (Patrick) Phelan of Bloomington, IL. He was preceded in death by his parents, four brothers, 3 sisters and 2 grandchildren. Hubert proudly served in the US Navy during WWII, serving on the USS Cacapon. He graduated from University of Illinois with a degree in electrical engineering and went on to work at Caterpillar, Inc as an electrical engineer at the Caterpillar Proving Grounds in East Peoria, for 34 years, retiring in 1989. Hubert was a was a member of the Knights of Columbus 3rd degree Spalding Council #427, St. Vincent de Paul Catholic Church and active in Cursillo of Peoria. He played in the Knights of Columbus Sand Trappers Golf League and the Caterpillar Bowling Leagues. A Funeral Mass will be at 2:00 PM on Monday, April 15, 2019 at St. Vincent de Paul Catholic Church, with a one hour prior visitation. Fr. Stephen Willard will officiate. Entombment with full military honors will follow at Resurrection Mausoleum in Peoria. Memorials may be made to St. Jude Midwest Affiliate or PAWS in Peoria. To send flowers or a remembrance gift to the family of Hubert J. Kleemann, please visit our Tribute Store. "Email Address" would like to share the life celebration of Hubert J. Kleemann. Click on the "link" to go to share a favorite memory or leave a condolence message for the family.